POLICE are trying to find a man who gave them the slip on a trail bike yesterday. 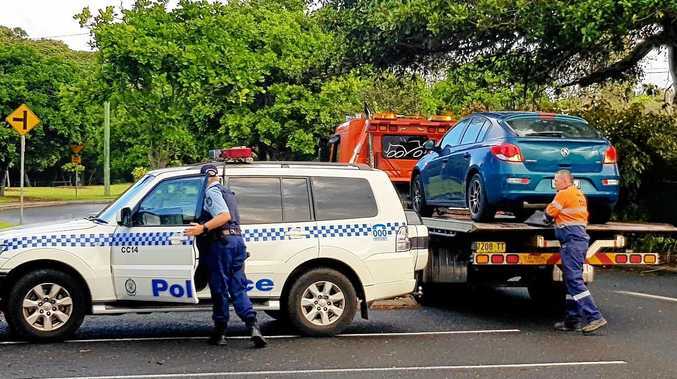 Highway patrol police were heading south on the Pacific Highway at Corindi at 10.37am when they saw an oncoming red Honda motorbike overtaking traffic. The bike had no registration plate and the rider sped off from police, who chased him into Eggins Drive at Arrawarra. Police said the rider reached speeds of more than 100km/h in a 50km/h zone. The rider dumped the bike on private property and fled on foot. He is described as 180cm tall, aged 25, with dark curly hair, wearing a black jacket and carrying a black backpack. The bike was stolen from Coffs Harbour last week. If you can help with the investigation, contact Coffs Harbour police on 02 6652 0299. In other news, a Woolgoolga woman, 21, was allegedly travelling at 124km/h on the Pacific Highway at Corindi on Sunday morning. Highway patrol police stopped the woman at 11.30am after clocking her speed on radar in a 100km/h zone. She was subsequently charged with speeding and driving with a cancelled licence.